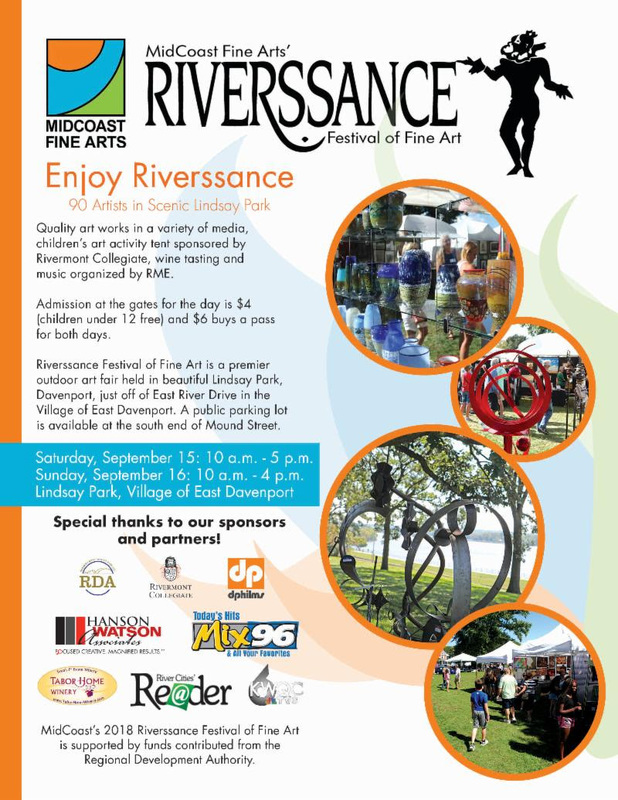 Riverssance is THE premier outdoor art festival held in beautiful Lindsay Park, in the Village of East Davenport. Why attend? Over 90 artists, including new ones. Wine tasting of Tabor Wines—Iowa grown. Children’s art activity tent hosted by Rivermont Collegiate. Great food available from Lagomarcino’s, Candy’s Ribs, Streets of Italy Pizza. End of summer local music assembled by RME in the park. This year’s Riverssance will be even better for two reasons, made possible through support from the Regional Development Authority. We've reached out to include more community members by offering admissions to the 42 social agencies affiliated with Quad Cities Open Network, as well as NAMI, Head Start and the Handicapped Development Center. For the entire community, we'll open the admission gates at no charge starting at 3 p.m. on Sun, Sept 16. Also new with RDA support, we've moved the presentation of the annual Harley Award to a 5:30 p.m. reception on Saturday during Riverssance. We hope exhibiting artists will stay and enjoy the event. Proceeds from the two-day festival will benefit MidCoast arts year-round programming. The annual Harley Award honors an individual who has positively affected the visual arts and artists in the Quad Cities during his/her lifetime. This year's Harley Award honors Rachael Mullins Steiner for her visionary leadership, enthusiastic spirit and continuing passion in creating a community arts culture. Rachael Mullins’ service to the local arts community has spanned nearly 30 years, from the 1990s grassroots Kanga Arts Cooperative to leadership roles in the development of the River Music Experience and Figge Art Museum. For MidCoast, she worked on creating Bucktown Center for the Arts and new program development, including the Art N’ Ally program, ArtWorks Expo, BASH!, ArtStroll and more. She's held roles at the state level in Iowa and Illinois, in local special events, and in advancing downtown development and cultural tourism across the Quad Cities community. This work included serving on the board of the Rock Island Arts and Entertainment District where she founded and led Gallery HOP! In 2004, Mullins recruited the St. Louis-based Venus Envy to Davenport, resulting in an all-female arts celebration across all arts disciplines. In partnership with the Quad Cities Convention and Visitors Bureau and MidCoast, Mullins led the creation of promotional materials and arts packaging such as the Art for Everyone public arts guide and the innovative Arts Mecca Cultural Tourism plan that laid a foundation for the Cultural Trust and other local economic development tools in the arts. Mullins holds a BA in Business Administration and Fine Arts from St. Ambrose and a Master’s in Business Administration from the University of Iowa. She currently serves as the Assistant to the Superintendent for Community Relations and Partnerships in the Davenport Community Schools. Through that role she's advanced arts education initiatives, including the annual Student Showcase and the founding of the Creative Arts Academy of the Quad Cities. Mullins was integral in the raising of nearly $3 million and supported many of the early partnerships that made the Academy a reality. Recently, Mullins joined the board of Davenport Sister Cities where she's proud to be promoting our local arts community as an international model, advancing cultural tourism, hosting visiting delegations, and exploring opportunities for local artists in residency and exhibition opportunities around the world. Mullins is also a practicing artist, having shown her art around the Quad Cities region and, most recently, in Davenport’s Sister City of Kaiserslautern, Germany. Mullins credits the inspiration of Quad Cities mentors such as Bruce Carter, Lloyd Schoeneman, Dean Schroeder, Todd McGreevey and Mary Ellen Chamberlin. I can say that Rachael has devoted an exemplary passion to leverage the visual arts in our community and now is an inspiration for others. Would you be an art angel? Or perhaps help with information or tickets? We'd love to have you help us out at this year's Riverssance Festival of Fine Art. Riverssance is a premier outdoor art festival held in beautiful Lindsay Park, Davenport. All volunteers receive a free t-shirt and entry. Daily shifts of two-hours are still needed for both days at 11:45 a.m. and 1:45 p.m., and on Saturday at 3:45 p.m.
5. Any preference in type of work: art angel (help artists with breaks), information tent, wine tent or ticketing. To volunteer, please send the above information to info@midcoast.org. Questions? Please email or call 563-424-1210. Riverssance 2018 is supported by funding from the Regional Development Authority. The 2019 MidCoast Call for Entries is now available. Artists will be considered for exhibitions at the Bucktown MidCoast Gallery in Davenport, Gallery West in Rock Island and Moline Centre Station. Exhibiting opportunities for original art are open to artists residing within a 90-mile radius of the Quad Cities. Group shows are eligible. Entries will be juried by a committee of MidCoast staff and board members. Selected artists will be given exhibition slots at one of the three sites for an approximate six-week period. Artists are responsible for transit and insurance. Download the 2019 MidCoast Call for Entries today! Support the Arts. Support MidCoast. We're a non-profit community arts agency founded and run by artists. Our mission to stimulate our community's cultural and economic vitality through the support of regional visual arts and artists is accomplished by having amazing art-focused programming and events like Final Fridays, ArtWorks Expo and Riverssance Festival of Fine Art. MidCoast projects are supported by funds contributed in 2017 from the Hubbell-Waterman Foundation, the Regional Development Authority and the Scott County Regional Authority, and from Quad City Arts Dollars, provided by the Illinois Arts Council Agency, Hubbell-Waterman Foundation, and John Deere. Open: Wed. - Sat., 11:30 a.m. - 5:30 p.m.
MidCoast Fine Art's Gallery West is proud to present new work by Muscatine fiber artist Chris Clark and sculptor-potter Joel Erickson. Sat., 8 a.m. - 5:30 p.m.; Sun., 9 a.m. - 5 p.m. This is the only art gallery in town that is open every day of the week! Open: Wed. - Sat., 11 a.m. - 6 p.m. Final Friday, August 31, 6-9 p.m. The evening's events are planned by Becky Hausmann and Elizabeth Wakita. A BIG thank you to Whitey’s for a matching ice cream gift. We’ll have all kinds of sprinkles and lemonade! Gallery Talk by Jessica Teckemeyer at 7:30 p.m. In the sculpture Devour (2015), deer and wolf writhe around each other, punctuated by the occasional growl. The powerful flanks of the deer at first seem to dominate the wolf, but a turn around the piece shows the predator’s jaws clutch a leg of the deer. The animals are a circle of life and death. Harley Award Presentation, Sept. 15, 5:30 p.m. Copyright © 2018 MidCoast Fine Arts. All rights reserved. from the Regional Development Authority and the Illinois Arts Council.